Survey123 Connect will convert your forms designed using the XLSForm specification into an XForm to be used in Survey123 and publish them to either ArcGIS Online or ArcGIS Enterprise. Some issues may arise during this process. When you create a new survey in Survey123 Connect, you use the XLSForm specification to design your form using a spreadsheet. Survey123 Connect converts the spreadsheet into an XForm, allowing you to preview your survey as it will appear in Survey123. Click the Refresh button in Survey123 Connect. If there is an issue with your survey, you'll receive an error from the form conversion service. In the following example, the error message explains that the issue is with the name entry called last name. In this case, the entry has a space in it. The space should be removed or replaced with an underscore or dash. In the example above, this error highlighted the question called last name. In that case, the error is the space in the name column. Another common error that will result in this message is when non-ASCII characters are used in the name column of either the survey or choices worksheet. ASCII characters can be used in the label column but not in the name column. This error tells you that one of your select_one or select_multiple questions is referencing a list that does not exist in the choices worksheet. In this example, the brackets should be removed. There should be choices for this question. This error tells you that one of your select_one or select_multiple questions that has the additional parameter of or_other as part of the type also has a choice filter defined. Select questions that include the option of entering a value of Other cannot be used in a cascading selection. Excel may have a lock on your file. Ensure the survey is not open by another application or user. You are running a previous version of Survey123 Connect. Be sure to upgrade to the latest version. Check that the certificate is valid, including details such as expiration date, common name, and issuer. Check that the root certificate in the certificate chain is correct and deployed to all devices. Check the intermediate certificates in the certificate chain. Check that the encryption algorithm used in the certificate is supported by the device. The typically used algorithm is SHA256. You can test the SSL certificates used in a web server using an online tester such as SSL Labs. Sometimes observed when working with very large surveys. Try again. Any error that has esri.com in the message is pointing to the old server. Be sure to upgrade to the latest version. This error is typically triggered by expressions in the relevant or calculation columns. Be sure to use curly brackets and include a $ symbol at the beginning of the statement. Report this to Esri immediately. The token that Survey123 Connect tried to pass to ArcGIS was not accepted. This is most often caused by a submission URL trying to pass a token to a public feature service. The Survey123 API is unavailable or has timed out. Try again after a short period. If the issue persists, refer to the Survey123 GeoNet group for more information. On the error dialog box, you have the opportunity to capture the error to send to Esri. Add any additional information to the email that might help in debugging your issue. These errors typically come from the issue of creating the items from your survey in ArcGIS. The named field is not present in the feature service designated by the submission URL, meaning that the survey's responses are incompatible with the survey. Either unassign the submission URL to create a new one, or ensure that your submission URL is to the correct feature service. Check that the user you have signed in to Survey123 Connect as has permission to access the feature service. This error occurs if the feature service you're submitting to relies on Global ID parent keys that aren't present in the survey. In the Publish Options window, set Use global id parent keys in repeat relationships to true. The survey you are attempting to publish has more fields than are allowed by a feature service in an ArcGIS organization (1,024). Reduce the number of fields to less than 1,024 and publish the survey again. The supportsApplyEditsWithGlobalIds property is set to false and needs to be true. The easiest way to do this is to enable sync when publishing your feature service. This error occurs when a survey with three or more levels of nested repeat is being published to Portal for ArcGIS 10.4. Reduce the amount of nested repeats being used, and publish the survey again. You cannot publish to ArcGIS Enterprise a survey that contains a question named end. If you have a question of type end, ensure that you name it something other than end. For example, name it endSurvey. A feature service published to a portal has a limit of 500 columns, including system fields, meaning that your survey can have no more than 494 questions. The workaround for this is to include a repeat, and set repeat_count to 1 to extend the survey over multiple tables. The names of questions in the survey worksheet must be 32 characters or less in length. You cannot upload Survey123 content to Portal for ArcGIS if you are not using ArcGIS Data Store. Submission URLs cannot be used directly with a nonfederated ArcGIS Server feature service. A workaround is provided by registering the service with ArcGIS Online or ArcGIS Enterprise. 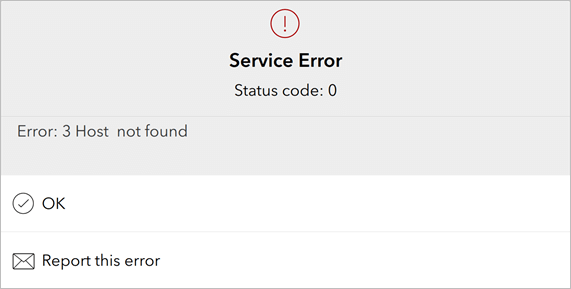 If you observe error messages that aren't listed in this topic, or other unexpected behavior, it may be useful to collect a log of information from the app to share with someone else (such as Esri Support) to troubleshoot. Survey123 Connect contains support for the AppStudio for ArcGIS Console tool, which provides the ability to capture messages sent from an app into a log that can be displayed on the desktop or the web, or saved to a file. You don't need to install and run AppStudio to use this feature. 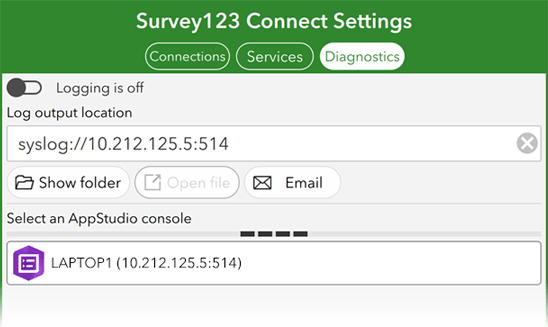 To enable logging in Survey123 Connect, click the Settings icon at the lower right of the help panel, and click the Diagnostics tab. To capture messages to a file, click the Logging switch to enable logging. When no AppStudio console is selected, the Log output location text box is automatically populated with the default log file location. You can edit this file path. To capture messages to a syslog-compatible console online, enter its URL in Log output location in place of the log file location. The Diagnostics tab displays any instances of an AppStudio console currently open on your network. A searching circle symbol will display on the Diagnostics tab until it has found a running AppStudio console. If you first select an AppStudio console, and click the Logging switch, logging information will start to appear in that console. For more information, see Capture console output in the AppStudio for ArcGIS help.